Usually trainings, lasting about two hours, begin with training all together. Such part is composed by warming up, basic techniques and suburi. After this collective part, different groups are formed with different programs and activities specific for the purpose and level of training: beginners, advanced trainers and agonistic group. It is not a fixed division or a rule. The team of agonists is composed by the people interested in attending local, national and international competition. For obvious reasons this kind of training focuses on preparing for matches and obtaining the level of fitness required. Participation to the agonist training is open to everyone who is interested. 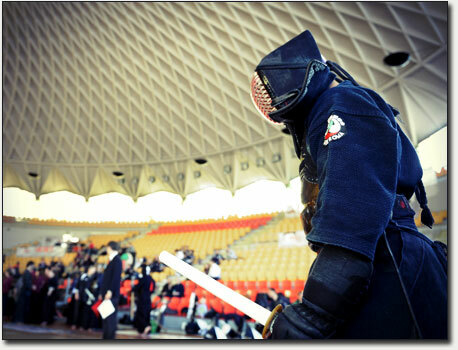 Trainings for advanced trainers also contemplate some fighting, even though they do not focus only on this aspect. Kiri-Kaeshi (切り返し): Series of strikes studied to improve the ability to hold the centre, the distance the correct technique while increasing stamina and the right spirit. Waza-geiko (技稽古): Practice of the basic Kendō techniques together with a partner who is receiving them. Kakari-geiko (掛稽古): Practice of short and fast movements, which teaches the continuous alert, the alacrity in attaching, the stamina and good spirit. Ji-geiko (自稽古): Free practice where the kendoka tries to put into practice everything he/she learned against an opponent. Gokaku-geiko (互角稽古? ): Practice among kendoka of the same level. Hikitate-geiko (引立稽古? ): Practice among kendoka of different level where the most expert one guide the less expert throughout the training. Shiai-geiko (試合稽古? ): Competition usually under arbitrage. Some training sessions are dedicated by every athlete to the study of katà, traditional fundamental techniques, following the directions dictated by the International Federation. It's not an easy issue to describe in words the training sections during the course of a whole year; for sure the best way to understand what's going on is to come to meet us at the Dojo. Nella fotografia: Un atleta dell'Accademia entra sul quadrato di gara..